The visitors opened the scoring after 21 minutes when Bobby Taylor burst free of the Dunston defence before lobbing the rooted Karl Dryden; giving Shields the lead at the half. An early second half freekick from Sean McRoberts doubled the Robins lead and gave the unbeaten hosts a mountain to climb. However, goals from Dan Capewell and Jake Stafford in the second half drew the hosts level. Dunston started the stronger of the two teams and in the third minute, Liam Brooks tested Greg Purvis with a low drive, however, the Robins keeper smartly tipped the ball away from the inside of the post. The pressure wasn’t easing and only one minute later, Callum Elliott struck a fine effort which cannoned against the crossbar before being cleared to safety. Having survived the early pressure, the Robins had a great chance to open the scoring following a scorching McRoberts and Summerly run in the 17th minute, however, Taylor’s strike was well blocked by a diving defender. This awoke the Dunston forward line and in the 21st minute, Purvis pulled off an outstanding save from close range to deny Jordan Nellis the opening goal of the night. Having survived all this pressure, Shields took the lead in the 27th minute when Taylor beat the offside trap, courtesy of a deft Callum Johnston pass, before racing through on goal and chipping the keeper. In an attempt to rediscover their sharpness in front of goal, the hosts began to throw more bodies forward and in the 35th minute, a well-struck effort from Elliott forced Purvis into a smart save low down. The Robins had one last attempt before the half to double their advantage after a foul on Adam Forster, however, the deeply swung freekick was an inch too high for Forster to reach at the back post. Dunston started the second half brightly and in the 50th minute, Andrew Grant-Soulsby had a shot from the edge of the box skipped narrowly wide. However, in the 52nd minute, the visitors doubled their lead when McRoberts swung an excellent freekick past the outstretched arm of Dryden from 25-yards out into the top corner of the net. 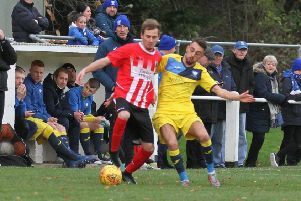 The hosts got back into the game in the 65th minute when after a questionable freekick decision, Dan Capewell connected with the ball to steer it past Purvis and into the back of the net. Despite this setback, the Robins continued to pressure the Dunston goal and in the 72nd minute, from a Craig Spooner cross, Jack Donnison’s header forced the keeper into a smart save. 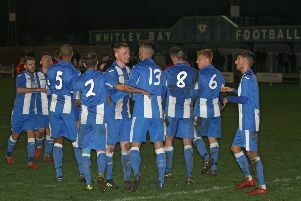 Almost immediately afterwards, the unbeaten hosts drew level when Jake Stafford’s connection from a well-struck corner beat Purvis and the Shields defence from close range. This goal opened the game up completely as both teams came surging forward in search of that all-important third goal. However, with time running out, neither team could find their way through one more time as both Shields and Dunston were forced to share the points.